One of the trendiest places to travel to right now: Costa Rica. I'm a follower not a leader in travel so I jumped on that bandwagon, too. I'm pretty sure AirBNB deserves the credit for making the country trendy. They've regularly featured treehouses with monkeys or just really chill vibes, then steer you towards the beautiful beaches and jungles and dayum- it looks lovely. My plan was to have a bunch of friends get a big house for $150/night and a private chef [they have so many cheap options] but getting adult friends to commit is nearly impossible, even though we finally have our own money to spend. We ended up going with another couple and getting my first ever all inclusive experience. All-inclusive is bittersweet to me. You can get a really good deal, drink unlimited beverages, get four plates of food at every meal, and have lovely pool time... but you also feel obligated to stay there and not explore. Luckily, I think we spent our time pretty wisely. The resort was right on the beach, with seemingly nothing else around. 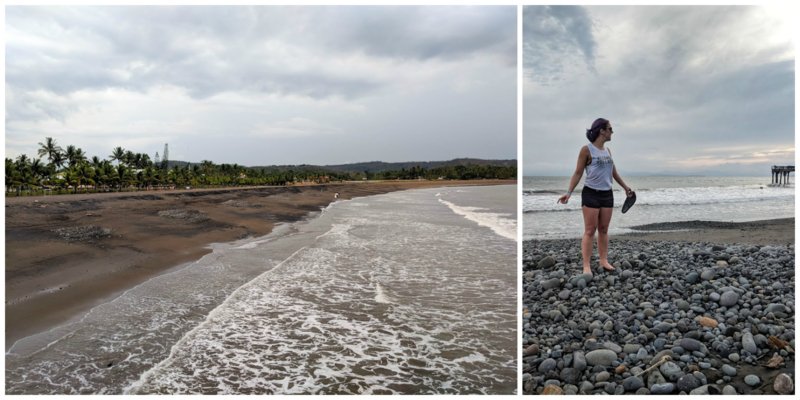 The beach had mostly black sand, and large volcanic rocks at the shore. Because of the rocks and the waves, we weren't allowed to swim in it. I tried to be a mf rebel and do it anyway, but having fist-size rocks come hurdling at your ankles isn't fun for more than .7 seconds. They were fun to look through, though. They had such fun colors and shapes and I planned on bringing them back to show everyone, but TSA stole them out of my carry on bag. WTF. It's one of those rare beaches that is not photogenic at all... but it's pretty cool when you're there in person. We woke up every morning by 7:30 to eat breakfast and be at the pool by 8am. It was strangely easy. It might have been the fact that I was on a mission to try every drink on the menu, but no one can confirm. We wanted to soak up that sun before heading to the jungles. Important thing to realize: While different locations in Costa Rica are technically close, the roads are insanely windy and it took us three hours to get to the mountains and volcanoes from the beach. Adventure #1- Lake Arenal area. I, once again, had starred everything I found on Pinterest that I wanted to try and see. There were 15+ things and I had to narrow it down to what was easy to do in one day.. on Friday the 13th. We chose La Fortuna Waterfall and Tabacon Hot Springs. The drive there proved to be terrifying. The roads are narrow and windy, and trucks are zipping around and crossing over lines like it's nothing. When we got towards the top of the mountain, the fog was so thick we couldn't see five feet in front of us. The man kept driving while I crouched behind the seat in the back, not wanting to see our death happen. Also, if you refuse to give a homeless person money on the road, they'll know where you come from and they'll hit your window and give you the middle finger. Stand your ground, okay? I will say, though... it's all worth it. There's so much to look at everywhere you go. La Fortuna is really easy to make happen, assuming you can handle going down 514 steps, and then back up when you're done. You just pay $15 a person at the entrance of the park and go. It's worth it. It was huge, and you don't have to spend too much time there, but it's still nice to see. 250 feet top to bottom of the waterfall, and a nice hang out/wading area to the side. 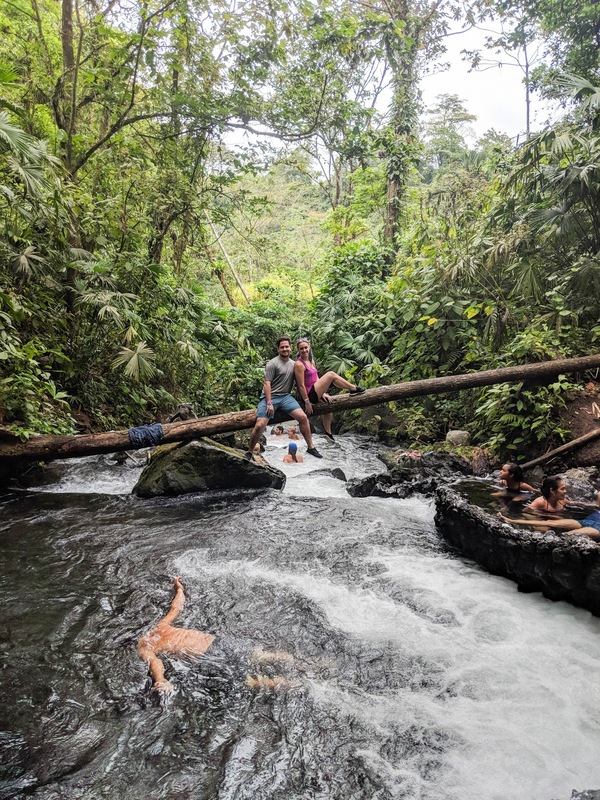 From Fortuna, Tabacon Hot Springs are only about twenty quick minutes. We GPS'ed to a resort, but after parking along the street, they sent us back to some little trail that went down to the hot springs that felt like a hot urban oasis in the jungle. 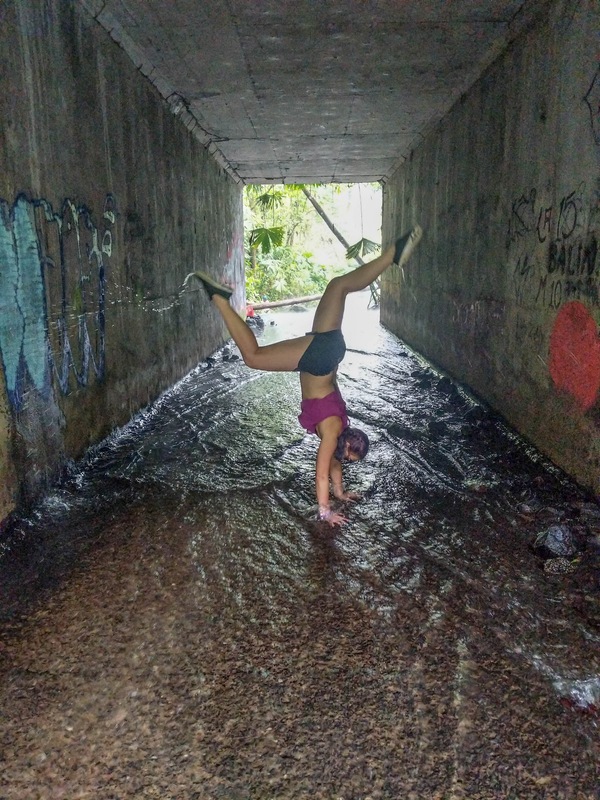 There was graffiti and cement, but also fallen trees, mossy stone steps, and natural round hot tubs. We spent under an hour here, but you could easily spend half a day and be happy. Besides the man who may have been on drugs and was just floating around, everyone was chillin, minding their business, and probably posted up there for a few hours. If you're a photographer- it's a dream place for a photoshoot with all sorts of backgrounds/scenes. I had all of these great ideas for brilliant pics but they didn't work out in my favor. I'm sure you could really kill it, though. 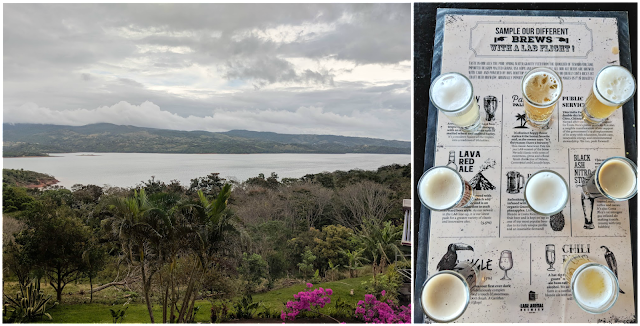 Because of the earlier foggy drive, we didn't want to risk driving the same way or in the dark, so I found Costa Rica's first craft brewery along the other side of the lake that only added about 10 minutes to our route, but gave us a completely different drive and views of every angle of the lake. views of the water and of beers. For adventure #2, we had to go ziplining. Again, my original plan was changed because of convenience, but I'm not upset with how it turned out. 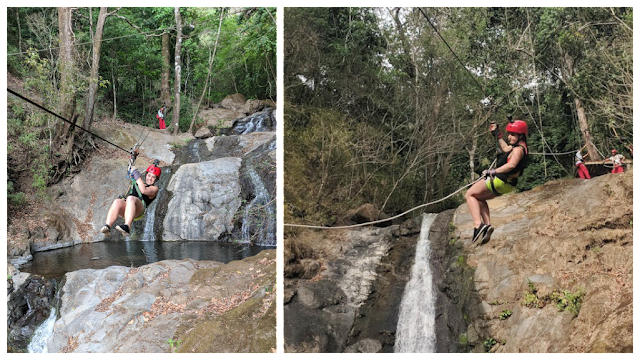 Instead of going back to the mountains and doing an above-the-trees course, we did one through the trees and over smaller waterfalls that was thirty minutes away- Adventure Park. We lucked out in getting a tour without anyone else [1:00 on a Saturday], which was a real game changer. No waiting, no unfamiliar faces in our photos... it might change the way I think about paying extra for a private tour in the future. My face on the right does not accurately portray how fun I thought it was. 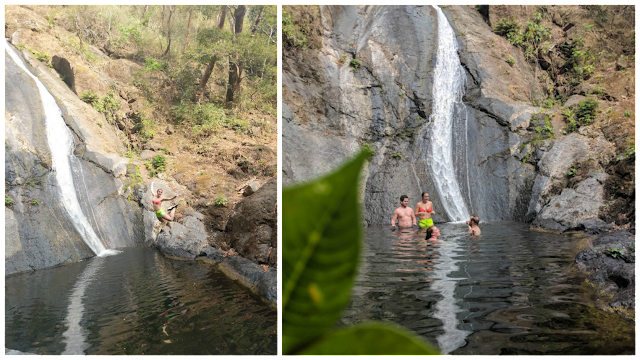 They also let us swim in a little waterfall/pool for a while, which again, was extra great with it only being the four of us. One of our guides even got fancy with his pictures he took of us. That leaf adds SO much privacy, amiright?! At night, it was vacation-business as usual- dinner, drinks, dancing... and some really extravagant shows that I hope you saw glimpses of on my Instagram story. At one point, the two of us ended up becoming the stars of the show. *shocker* My drunk and ADD mind could not focus on lines though and I don't think the show runners appreciated that. 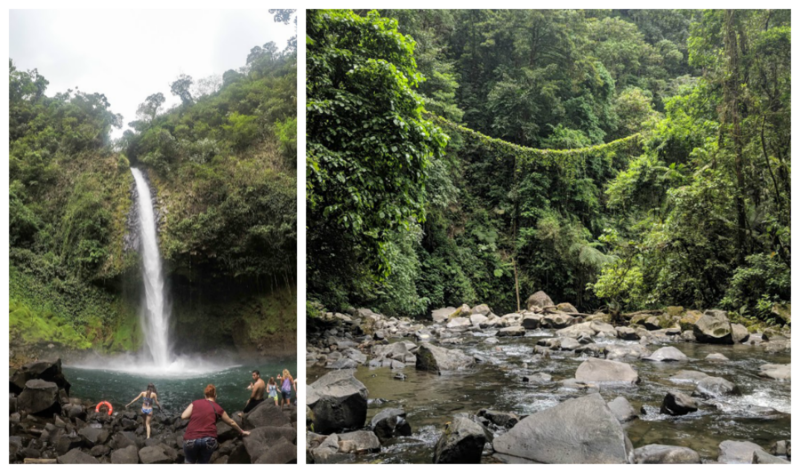 If you're thinking of going to Costa Rica, DO IT. You can easily do a full week if you're driving to stay in different places every two days. That would be the only thing I'll do differently next time I go- don't stay in one place the entire time you're there. When it comes to the food- don't expect spicy. I was surprised to find out that Costa Ricans hate spicy food, but it's all very flavorful, with a bit more sweet than spice. They don't have a military, and I find that to be very cool. They're also very proud. The people who work in tourism seem to have a much better quality of life than those who don't... and the tourism workers know how to help you out [with hopes of a tip]. Sloths and monkeys aren't going to be everywhere like they suggest... at least not in regularly traveled paths. We saw exactly zero sloths, and the only monkeys we saw were at the Monkey House. Now, because it wouldn't be a vacation post without a handstand pic, there's this one from the hot springs.